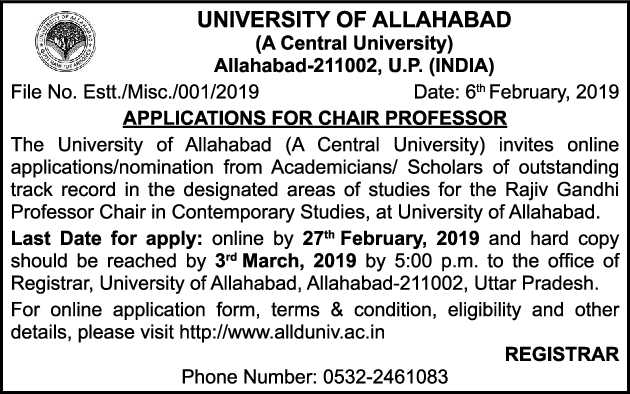 University of Allahabad has advertised in THE HINDU newspaper for recruitment of Chair Professor jobs vacancies. Interested and eligible job aspirants are requested to apply online on or before 27th February 2019. Check out further more details below. About College : Allahabad University has always occupied an esteemed place among the universities of India for over a century now. Established on 23rd September 1887, it is the fourth oldest university of India after Calcutta, Bombay and Madras University. The credit for conceiving a large Central College at Allahabad, eventually to develop into a University, is due to Sir William Muir, then Lt. Governor of United Provinces. As a result of his initiative the foundation stone of the Muir Central College (named after him) was laid on Dec. 9 1873 by His Excellency Lord Northbrook. How to Apply: Interested and eligible candidates are requested to fill in the online application form at the official website and the print copy of online applications should be sent through email to the official email id i.e registrarau.uoa@gmail.com and candidate are also send duly signed hard copy of the same to the office of Registrar, University of Allahabad, Allahabad on or before 3rd March, 2019.